University of Illinois researchers have developed a way to heal gaps in wires too small for even the world’s tiniest soldering iron. 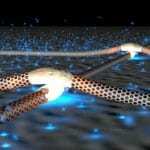 Led by electrical and computer engineering professor Joseph Lydingand graduate student Jae Won Do, the Illinois team published its results in the journal Nano Letters. Lyding’s group teamed with Eric Pop, an adjunct professor of electrical and computer engineering, and John Rogers, Swanlund professor in materials science and engineering, experts on carbon nanotube synthesis and transfer, as well as chemistry professor Greg Girolami. Girolami is an expert in a process that uses gases to deposit metals on a surface, called chemical vapor deposition (CVD).